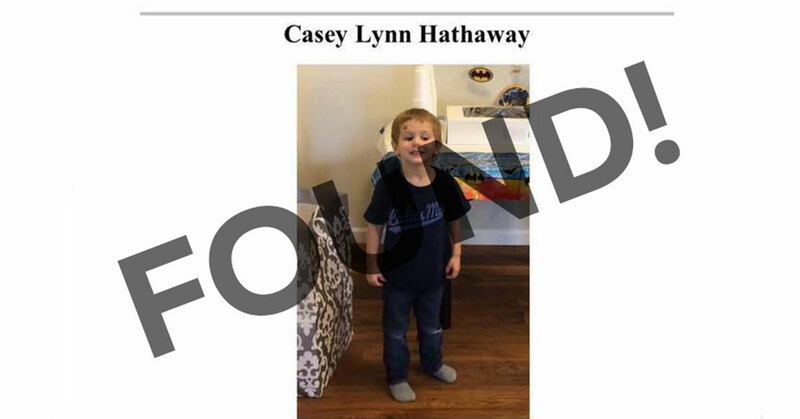 Sheriff: Missing North Carolina 3-year-old Casey Hathaway found alive in Craven County after being missing for two days. NEW BERN, N.C. (AP) — Sheriff: Missing North Carolina 3-year-old Casey Hathaway found alive in Craven County after being missing for two days. The search for 3-year-old Casey Hathaway continues in Craven County, North Carolina. The Craven County Sheriff’s Office is leading the investigation to find Casey. He was reported missing on January 22, 2019, by a relative. Casey had been playing outside the home with two children he is related to and he did not come back inside with them. A relative in the home searched for Casey and when they were unable to find him, called 911. Craven County Sheriff’s Deputies responded within minutes. An intense search began and has expanded by the minute. Today, hundreds of professional searchers and volunteers walked through rough terrain around the home to try and locate Casey. Volunteers were sent home for the night due to safety concerns. Professionally trained searchers will continue to work overnight. Additional search assets will return in the morning. Volunteers should meet at the staging area at 8:00 tomorrow morning at New Haven Church located at 2755 Aurora Road, Ernul, North Carolina. Anyone living near Toler Road in Ernul, North Carolina, where Casey was last seen should check their own properties to assist us to locate Casey. Casey is white, with blonde hair and brown eyes. He weighs 25 pounds and is 28 inches tall. If you see Casey or have information to help us locate him, call the tip line at 252-636-6703 or the Craven County SO at 252-633-0498.